Brooklyn is such a vast place and perfect for exploring. On the first day of our trip we went out to Williamsburg. Mostly we walked around in awe at all the development that is going on. There are so many well-designed, beautiful condo buildings being built. I really couldn’t believe how much it’s changed since the last time I was there. 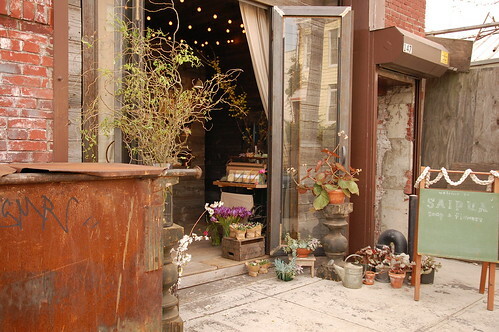 On Sunday, I convinced Andrew to head out to Red Hook to visit the flower shop, Saipua. Red Hook is an area that is still fairly untouched. Yes, there is an Ikea there, but it is not the easiest place to get to by transit. We took the subway into Brooklyn, but ended up taking a cab the rest of the way. The cab dropped us off on Van Dyke street which is very industrial, but also close to the water. One of the first things we saw was a sign for ‘key lime pie’. I couldn’t believe we happened upon a place that specialized in one of my favourite pies out in the far reaches of Red Hook. Steve’s Authentic Key Lime Pies are delicious, by the way. We got a couple mini tarts and ate them with some limeade out by the water. Our next stop was Saipua. It’s tiny. Even smaller than I imagined, even smaller than Purl Soho. But, it’s beautiful and I bought myself some of their handmade soap. They have a darling shop dog too which made me miss Maisy. Just around the corner on Van Brunt is another little pocket of small shops and restaurants. I was delighted to find the both Erie Basin and Baked were among them. From here we actually walked all the way to Cobble Hill to check out Smith Street. 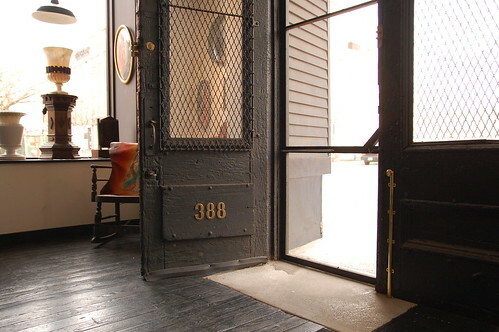 Smith Street is a great place to visit in Brooklyn which is quite full of lovely shops and restaurants. We were getting quite tired and the shops were about to close, but we managed to make it to Smith & Butler which was another awesome surprise discovery. Yeah Brooklyn! Can’t wait to get back to explore more. Key lime pies in all sizes. 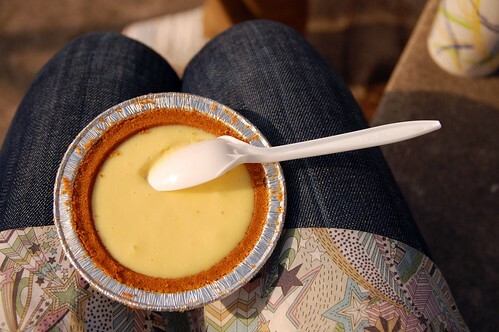 A delicious way to start your Red Hook adventure – eating key lime pie by the waterfront. I’ve admired Saipua from afar, so was excited to see this tiny shop in person. I would love to go to their ‘flower school’. I didn’t realize this famous bakery was in Red Hook. I was full of key lime pie, so didn’t try their baked goods. Next time! This shop was awesome. It had a little bit of all this things I like. Cute little yarn shop & cafe. You are better behaved than we were when we were there! We purchased an entire pie, sat down at the little table they have outside and ate the entire thing. Like animals. It was delicious. looks like you had a good time. thanks for sharing the pics and shops. I’m a big fan of BDDW – what a beautiful space they have. beautiful condos? williamsburg has been ruined by shotty developments and suburban mcmansion architecture. jackson – you’re right. i’m sure that if i lived in williamsburg, i would be annoyed with the development. i think i was just impressed with the designs compared to the truly awful condos we have here in toronto. there were two in particular we saw that i really liked. one with louvered wood panels on the front and the other with big warehouse style windows. they are the ones that stuck out in my mind and they were also the ones with the smallest footprint. Can we go to ‘flower school’ together? I’ll drive! Business write off! !